Serving Wichita, Derby, Mulvane and the	surrounding areas for over 20 years. 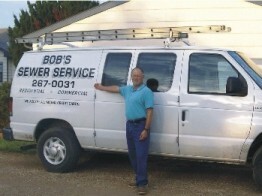 Bob�s Sewer Service knows that time is of the essence when you have a sewer problem and we're just a phone call away. If you need a free estimate on a sewer repair or replacement we will be glad to do so. And the next time you buy a house don't forget to have the sewer lined checked first. So give us a call at 316 267-0031 and we�ll do our best to assist you, even if it's just to ask a question.